Thank you to Carolyn Paras, Economic and Community Planner for the Greater Portland Council of Governments, for supplying this information. According to the 2000 Census, 1,391 persons aged 62 and over live in Yarmouth; about 93% live in a household, and 7% live in a nursing home. The elderly head 785 of Yarmouth’s households: 21% rent, and 79% own a home. Approximately 44% of Yarmouth’s elderly households are of low to moderate income. This compares to 61% for elderly in the rest of the county. 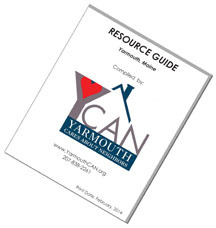 Of Yarmouth’s elderly households, 43% of renters and 17% of homeowners have a mobility or self-care limitation. This means one or more persons has a long-lasting condition that substantially limits one or more basic physical activity (such as walking, climbing stairs, reaching, lifting, or carrying) and/or a physical, mental, or emotional condition lasting more than six months that creates difficulty with dressing, bathing, or getting around inside the home.